On the 9th of May 1945 Channel Islanders tasted freedom for the first time in nearly 5 long and terrifying years for it was on that day that the British forces finally liberated Guernsey from German Occupation. One of the first casualties when the Germans arrived on the island on 30th June 1940 was the truth, or at least the right to press freedom. 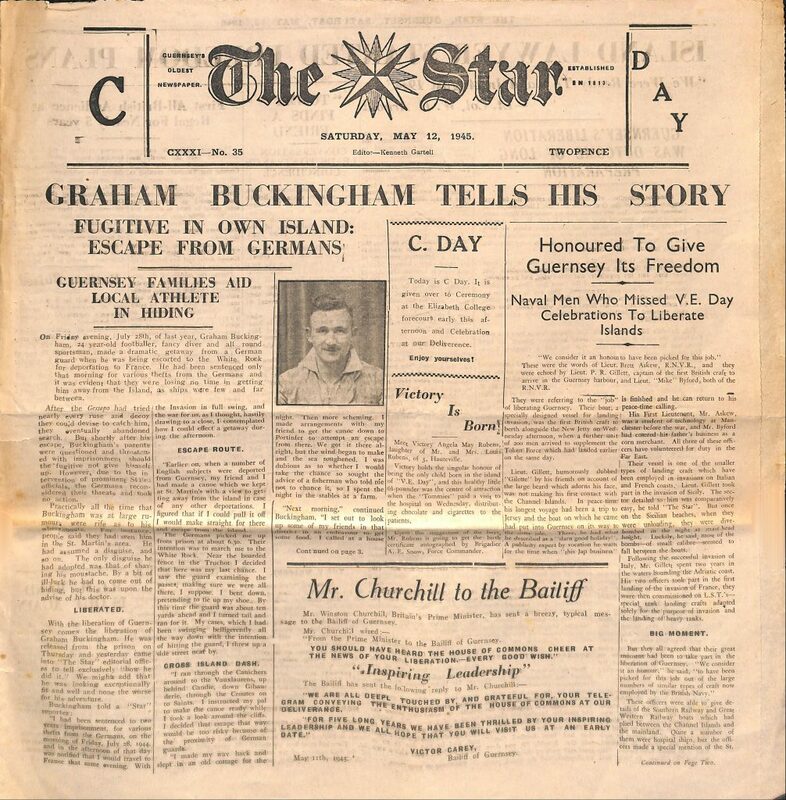 The Germans immediately took control of the 2 local Papers – “The Star” and “The Guernsey Evening Press” so that the daily news diet for islanders became a series of propaganda stories extolling the superiority of the German Reich and the supposed weaknesses of the Allies. That all changed on 9th May 1945 when islanders could finally both hear and tell the truth of what had gone on in their beloved Guernsey. It was as if the island had been holding its breath for 5 years. You can almost hear an explosive exhalation in the post liberation newspapers with people telling their individual stories, of acts of heroism and small acts of quiet defiance in the face of an all crushing tyrannical enemy. In this article we look at one such story. 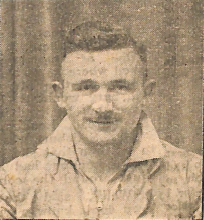 "GRAHAM BUCKINGHAM TELLS HIS STORY : FUGITIVE ESCAPE IN OWN ISLAND: FROM GERMANS - GUERNSEY FAMILIES AID LOCAL ATHLETE IN HIDING"
On the evening of Friday July 28th 1944, 24 year old local footballer and athlete Graham Buckingham was being escorted to the White Rock for deportation to France after having been sentenced only that morning for various thefts from the Germans. Clearly the Germans were losing no time in getting him away from the Island, with the situation worsening for them in the neighbouring Normandy peninsula after the successful June 6th Allied landings there. It was at this point that Graham took his life into his own hands and made a dramatic getaway from his German guard. “The Germans picked me up from prison at about 6.30. Their intention was to march me to the White Rock. Near the boarded fence in the Truchot I decided that here was my last chance. I saw the guard examining the passes, making sure we were all there, I suppose. I bent down, pretending to tie up my shoe.. By this time the guard was about 10 yards ahead and I turned tail, and ran for it. My cases, which I had been swinging belligerently all the way down with the intention of hitting the guard, I threw up a side street near by. Graham Buckingham’s liberation came a day later than his fellow islanders as it wasn’t until Thursday May 10th, the day after British Forces landed, that he was able to taste the heady feeling of freedom as he was finally released from his prison ordeal.